This colorful book allows children to have fun counting in six languages from one to twelve while reinforcing the deep meaning of symbols in the Orthodox church. It helps stimulate children's spiritual growth in a creative way. Take the journey of a lifetime with Christina that every believer hopes to undertake. This is a unique book created to help children love and appreciate the sacred and precious land of our Lord's birth, life, death and resurrection by walking the footsteps of Christ our Savior as a pilgrim. Ages preschool and older. This unique coloring book is based on the original Christina Goes to the Holy Land but developed to encourage the very young to one day make the journey of a life-time that every believer hopes to undertake by coloring the holy places. Spiritually enriched with quotes from the Bible. Educational for all but created for the very young. Features colorful Byzantine icons with beautiful illustrations by Antonia Marshal explaining in children's language the lives of the four evangelists: Matthew, Mark, Luke & John. This close-up look at the writers of the Holy Gospels includes rich spiritual and theological knowledge in very simple words for children to understand with notes for parents and map. For ages preschool and up. Features colorful Byzantine icons explaining in children's language the lives of St. Anna, St. Mary Magdalene, St. Photini, St. Brigid, St. Mary of Egypt, St. Theodora and St. Elizabeth. This lovely book helps children get to know the champions of the One True Faith. Knowing many examples of people who place God first in their lives can give children the courage to meet different challenges in life. Beautifullly illustrated, this book is a superb tool to help parents explain in a child's language how Orthodox Christians pray, make the sign of the cross, light a candle, kiss an icon, have a Bible and receive Holy Communion. For ages preschool and up. A beautifully illustrated classic book that introduces children to the seven mysteries (sacraments) of the Orthodox faith. A powerful learning tool to teach children in meaningful ways about the lasting values and rich traditions of the Orthodox Church. Offers spiritual nourishment that helps young readers feel close to God and strengthens their faith. There are notes at the end of the story for adults who wish to initiate discussions about God with young children. 8 x 10 1/2. Elementary grades. Uses the alphabet (A to Z) to talk about words that are basic to the Orthodox Christian faith. A is for angel, B is for baptism, C is for Communion, etc. For ages preschool and up. Very young children can color the line drawing on each page and use their imagination to draw religious images, while older children can write sentences and/or stories to explain their art. 60 pages. Young children can count items in church in five languages. 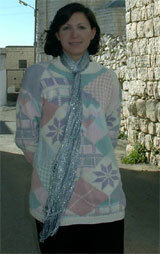 Maria Khoury reads "Christina Goes to the Holy Land"
Other Books by Maria C. Khoury, Ed. D.
This well-written book brings to our attention the intolerable conditions under which Palestinian Christians and others live in the Holy Land. The author, a noted Orthodox writer who lives there, describes vividly the inhuman conditions she experiences. The chapters literally bring tears to one's eyes. Her experiences foster awareness of the dramatically diminishing Christian presence in the land where the faith began. The author serves as a witness as she tries to bring to light the truth of what is happening and to change people's minds and hearts. 222 pages.